We are commercial appliance repair specialists. Our service is fast, professional and convenient. Whether you are restaurants, a food vendors, food truck, cafeteria or catering company, we can help you with all of your appliance needs. Our technicians are specially trained and certified to work with all brands and models of commercial appliances. We specialize in Asko, Bertazonni, Bosch, Dacor, DCS, Electrolux, Fisher&Paykel, Frigidaire, GE, Jenn-Air, KitchenAid, La Cornue, LG, Liebherr, Marvel, Miele, Perlick, Samsung, Siemens, Sub-Zero, Thermador, Traulsen, True, Viking, Whirlpool, Wolf and many more. We know that your whole business often depends on how well your oven or refrigerator is working. That is why we try to make our work fast and convenient. We will schedule the same day appointment and expedite getting the right parts for you. Our company will work around your schedule and make sure not to disturb your customers or your employees. Our experienced and friendly technicians always come on time and clean up after themselves. Customer satisfaction is very important to us. Besides being very experienced in commercial appliance repair, we try to keep our clients happy. Our technicians are very punctual, respectful and friendly. They know their job well and always learn new things. We offer you FREE service with any repair as well as a FREE, accurate estimate. There is warranty available for both parts and labor. Our team makes sure you are satisfied with the outcome! For professional commercial appliance repair, please call us at 541-948-8835 or fill out our short contact form. We will provide you with a convenient time window for your repair appointment. Our tech will be on his way bringing with him all the equipment and tools necessary. He will thoroughly examine your broken commercial kitchen appliance. Usually, commercial appliances get a lot of use out of them. Sometimes dirt and grease get into internal parts. Often you will not even be able to see what is going on unless the whole appliance is completely taken apart. You need a professional to do the job for you. Whether you have a commercial deep fryer, refrigerator, stove or a roaster, our technician will be able to take it apart and clean it out. Often after a long time use, certain parts get completely worn down. In that case, a new part needs to be ordered. We will order correct parts for you from the manufacturer and make sure you get the best price possible. The delivery might take few days and up to a week in some cases. Our company makes sure to be fast about it. We will schedule you as soon as possible for an installation. Once parts are installed and cleaned your appliance will be as good as new. It will be fully functional, clean and safe. We will remove all the old parts, clean up and put things back into place. 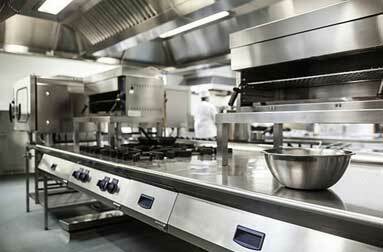 Your commercial kitchen will be back to normal in no time. Oregon Appliance Repair has an annual maintenance program geared towards our commercial customers. With this plan, you get annual or biannual appliance maintenance appointment with one of our skilled technicians. You decide on what you need for your particular business. Our tech will examine all of your appliances, change filters, clean them and do maintenance work. He will catch any issues early on before they become big and expensive problems. He will give you expert advice on how you can best take care of your appliances in between service calls. Finally, if you have any questions at all you can always call us in, and we will advise you over the phone. With this plan, you can have complete ease of mind knowing that your appliances are working good and will continue to work for a long time to come. In the long run, you will be able to save a lot. We know how to work with commercial clients. Our experience in this field is more than 30 years. Not only are we familiar with every commercial appliance brand out there. Oregon Appliance Repair technicians are factory trained and certified on the majority of them. We will take on a project of any size and degree of difficulty. Our relationship with suppliers will allow us to get the right part for you and to get it delivered fast. When time and convince is important we are ready to help. Our technicians will do the job right the first time. For professional commercial appliance repair, please call us at 541-948-8835 or fill out our short contact form. We will be happy to set up a convenient appointment for you. Our friendly and highly skilled licensed technicians will soon be on their way to repair your appliances. Same day appointments are available for Bend Deschutes River Woods, Redmond, Three Rivers, Sisters, Terrebonne, Terrebonne, and Prineville. We also do residential appliance repair. We are commercial appliance repair specialists. Our service is fast, professional and convenient. Whether you are restaurants, a food vendors, food truck, cafeteria or catering company, we can help you with all of your appliance needs.